On Monday, June 27, 2016, join Scott Abel, The Content Wrangler, for part one of a three-part webinar series on content delivery. 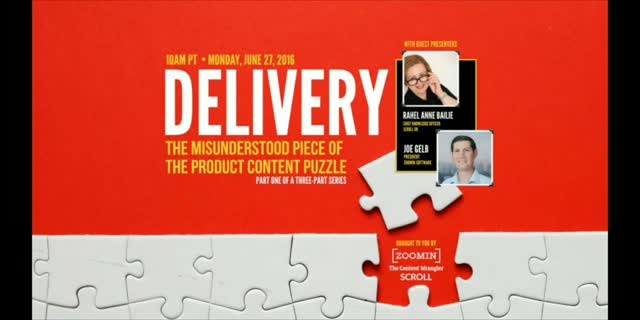 The first webinar in the series kicks off with a discussion about delivery with content strategy maven Rahel Anne Bailie, Chief Knowledge Officer at Scroll UK, and intelligent content guru, Joe Gelb, President of Zoomin Software. You’ll learn what delivery is, where it fits, why it’s important, and how it works. You’ll discover how some forward-thinking organizations leverage the power of dynamic content delivery to ensure prospects and customers alike have access to the right product content when, where, and how they need it.